Sharon B’s Online Embroidery Classes to Start in February! Posted on January 23, 2007	by Linda S.
February is a highlight month for embroiderer’s around the world. Sharon’s online classes through Joggles.com will be starting again. Her Personal Library of Stitches will begin on February 20 and her Encrusted Crazy Quilting will begin on February 9. Her daily blog is an inspiration, but I can hardly wait to get into a more in-depth study of what makes her blocks come to life. I signed up today for the Personal Library of Stitches. 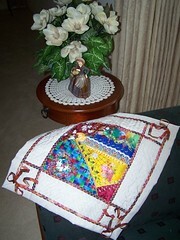 This entry was posted in Crafts, Embroidery, Handcraft, Handwork, Needlework, Online Classes, Quilt, Sewing. Bookmark the permalink.